Lighting is a quick and easy way to subtly enhance the ambience of a room, but with so many options available to you it can be hard to know how to make your interiors shine. Walk On Rooflights will transform the look and feel of a room with an abundance of natural lighting – beautifully constructed, but also strong and secure. These dual-function rooflights really are spearheading architectural design and are instrumental in adding value and style to your home. Our Walk On units will revolutionise the way you think about rooflights. With endless design potential, you really can create stand-out style to last. Not only are they beautifully crafted with subtle contemporary character, they’re also resilient, efficient and guaranteed to last. What’s more, they’re ultra-modern with frameless design, blending seamlessly into your current interiors. With soft under-foot touch and sleek style – the exceptional features don’t end there. The added benefit of Walk On Rooflights is that you can create a streamlined appearance throughout your home, for both indoor and outdoor use. Explore Walk On options to discreetly distinguish your upstairs and downstairs living areas, allow light to flood through your home and be at the forefront of interior design – Walk On Rooflights allow you to have it all. Whether you choose to have internal or external Walk On Rooflights, you’ll enhance the look and feel of your room and the way you use it, with an ergonomic and dynamic flow of light and air throughout your home. Why Choose Walk On Rooflights? For market-leading performance and stunning design, choose Walk On Rooflights, which are crafted from first-class materials and engineered to last. If that weren’t enough, you can add value to your home with these ultra-modern design updates. Our strong and durable Walk On options include market-leading glass panes built with 50mm double-glazed units, complete with a 25mm tempered and heat-strengthened laminate outer pane; finished with a 16mm cavity and a 80.8mm veneered inner pane. This ensures your rooflights are strong and secure enough to walk on. For extra resilience, the external frame is powder-coated for a superior finish and the glass is sealed with a finishing flush, allowing water to easily drain away. 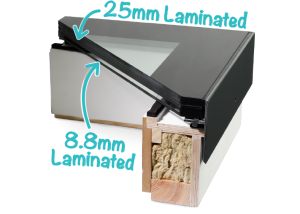 The internal glass pane features a 115mm silk band, offering UV protection to the internal gaskets. You can even add a non-slip coating, which helps to reduce any potential slip hazards. The seamless construction of the frames (in some cases frameless) also reduces any risk factors, so your new Walk On Rooflights will give you peace of mind as well as serious style credentials. The U Value of our Walk On units are 1.06W/m2K (watts per square metre, per degree Kelvin), meaning they’re significantly lower than those specified by current building regulations. So you can rest assured that your rooflights will reduce your energy bills whilst increasing light and style in your home. Walk On Rooflights are cheaper than you may think, so with affordable options in a range of sizes, you are one step closer to transforming your home design, inside and out. Prices start from £1,499 and a range of sizes are available, including 800 x 800, 1000 x 1000, 1000 x 1500, 1000 x 2000, 600 x 2400 and 1500 x 1500 so you’re sure to find one to suit the size of your home. Bespoke options are also available to tailor fit your space with cutting-edge design. Looking to increase the value of your home with extraordinary design? 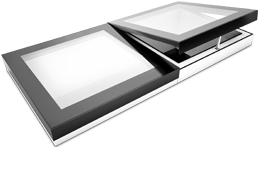 Contact EOS Rooflights today for more information on our Walk On Rooflights range. Have you had Walk On Rooflights installed in your home? If so, we’d love to see a photo. Send in pictures of your striking new fixture and we’ll add it to our gallery, where it can inspire others’ interior style.